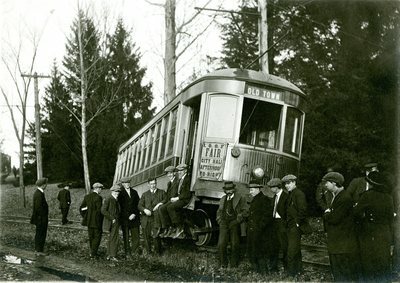 "Old Town, Maine, B. R. & E. Car Wreck "
An image scanned from a black and white photograph of several men standing near a trolley car that has come off its tracks. A handwritten caption on the back of the photograph reads, "Car wreck, B. R. & E. - Fall, 1914." The sign at the top of the car reads, "Old Town," and an advertisement on the car says, "I. O. O. F. Fair, City Hall, Afternoon to Night." The Bangor Railway & Electric Company operated trolleys on an electric railway between Bangor and Charleston, Maine, in the early 1900s. The company's Old Town Division included stops in Bangor, Veazie, Orono, Old Town, and the end of the line at Jameson Street in Great Works. Original photograph a gift of the family of Raymond Percival "Pete" Somes, University of Maine Class of 1916.